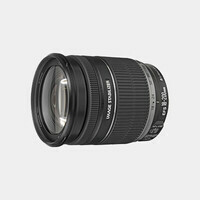 The Tamron 18-270mm f/3.5-6.3 VC lens for Canon is a 15x zoom lens designed exclusively for digital SLR cameras using the more compact (APS-C) digital size image sensors. The focal length of this lens is equivalent to approx. 28-419mm in 35mm format. Designed as an "all-in-one" lens, it will meet most photographic opportunities.